Mojopost is taking a long weekend to partake of US Independence Day festivities. 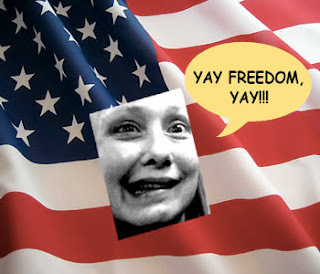 In my country, July 4th begins on the 3rd and ends on the 6th, so that all residents in the US will have an opportunity to celebrate our freedom from those limey Brits with poor dental hygiene. Whew - bullet dodged! This Independence Day has value-added significance in that US citizens will, for the first time ever, lustfully worship before a golden statue of our favorite unicorn, Pres. Barack Obama. There will be Kool-Aid, hopium and Hawaiian birth certificate dispensers on every corner! Rev. Wright, say AMEN before I pop! I will be celebrating Independence Day weekend at Taste of Chicago, checking out the 85th Army Band, and enjoying poop-your-pants-loud fireworks over Lake Michigan. After a little sleep, I’m going to the Indiana Dunes because it is one of the better places to be if one does not have an ocean handy while in the Midwest. If I see any Michael Jackson mourners in Gary, I’ll tell them you said “hi”. Let’s get this BBQ jacked up, kids. Hit me back with some of your favorite summertime songs. Ug. I don’t even want to bring this up in a family-oriented blog but I must. I need to vent about my neighborhood non-bathing, muttering, crazy/scary guy who was playing with his bits and pieces at the bus stop the other day. We will call him Moby Prick. There I was, traveling in my car with goodwill ambassadors from another country. At the stoplight on the corner, Moby Prick was sitting on a bench inside of a bus shelter staring painfully, with animal longing, at a young lady seated to his left. She may have been 16 years old – maybe less. This could have been like any other day except for the fact that Moby was manipulating his region, which was fully extended inside of his filthy sweatpants. It was rather obvious that he was setting up things for display, to catch the attention of the young lady. I don’t know how she kept her eyes fixed on the CVS sign across the street because the thing in Moby’s hand was epic. Like a monster! And what did I do? I split when the light changed. I’ve gone over a few heroic, righteous should-have scenarios in my head because I lost an opportunity when it presented itself. I’m mad that I didn’t do anything constructive the other day to help the girl at the bus stop. Moby Prick escaped and I am Ishmael. What would you have done differently? I’m sorry, but I just don’t see me calling 911 to report a homeless erection. If I see this guy again, and that is likely because he lives at that bus stop, is there something I can do when he Queequeg’s his harpoon? I've been tardy. I spent the weekend entertaining goodwill ambassadors from Venezuela, and they gave me chocolate! These people are, perhaps, my most favorite goodwill ambassadors in the history of ever. Not only did they arrive with candy, but there was coffee, too! Wheeee, I'm all kinds of buzzed! Therefore, this blog will be off-line until Thursday morning. Imma crash hard when the sugar wears off.